The Pulsar 2415 NT 2,500W (4,000W optional) Production Laser System continues the latest developments in machine, CNC and laser resonator technologies. In contrast to the traditional “jack-of-all-trades” laser cutting machine, the Pulsar 2415 NT is a specialist in high production of short run sheet metal parts. Stealth clamps reduce dead zones and maximize material utilization. Full machine width work chute automatically unloads large parts and allows flexibility in the location of the lead-in/lead-out points. The machine configuration allows several parts to be unloaded simultaneously, increasing throughput. 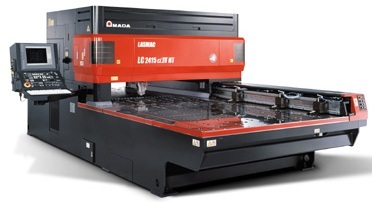 The high speed CNC incorporates a cutting data library and available network interface. The advanced, turbine driven, RF excited, fast axial flow CO2 laser automatically calibrates itself at power-up, ensuring parameter repeatability.